As each year we approach the time of Remembrance there is always a mild consideration as to whether the wider public’s sentiment and appetite for this emotional subject still remains. And yet each year if anything, there is a greater outpouring of gratitude and sentiment than ever. This year has proved to be no different as the team from the Museum was busy not only with Remembrance events within the Museum and Elvington village but also further afield too. Here is an overview of just some of the events and ceremonies we were represented at across Europe this November. 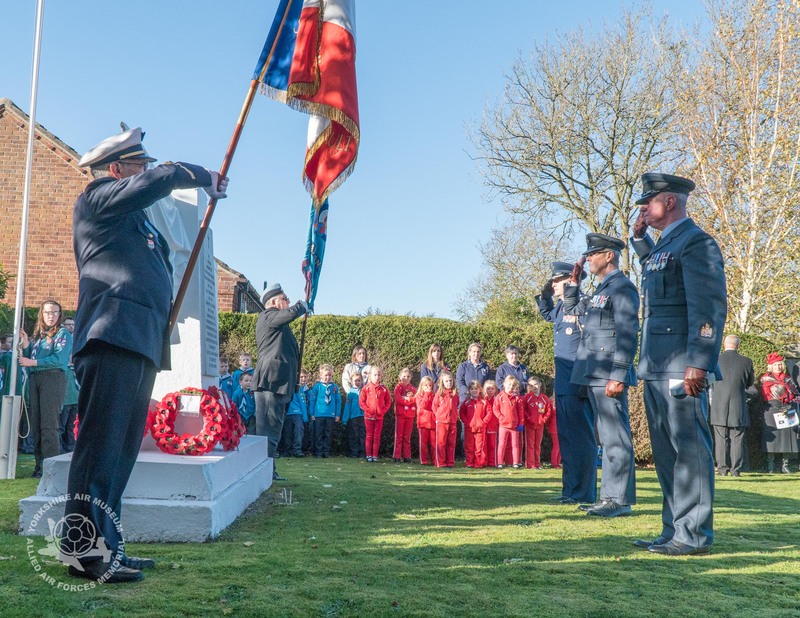 We were represented by our friends at RAFA at several events across France, while here in the UK, Museum Heritage engineer Gary Hancock laid a wreath at Stockton on Forest while Museum trustee John Edmonds laid a wreath at nearby Sand Hutton. Museum director Ian Reed represented the Museum at the memorial commemoration for 346 & 347 at the cathedral in Les Invalides, Paris before travelling to the Bomber Command Memorial in Green Park, London along with the British Air Attache and the French Defence Attache and the Vice President of RAFA as well as at the War Memorial in central London at a ceremony attended by the Coldstream Guards and the Mayor of Westminster. The following day, we attended the Canadian Memorial at Brookwood Cemetery and the adjoining French Memorial there, where some airmen who lost their lives flying from Elvington now rest. Here at Elvington, we marked the sixtieth anniversary of the establishment of the Groupes Lourds (Heavy Group) memorial in Elvington village. 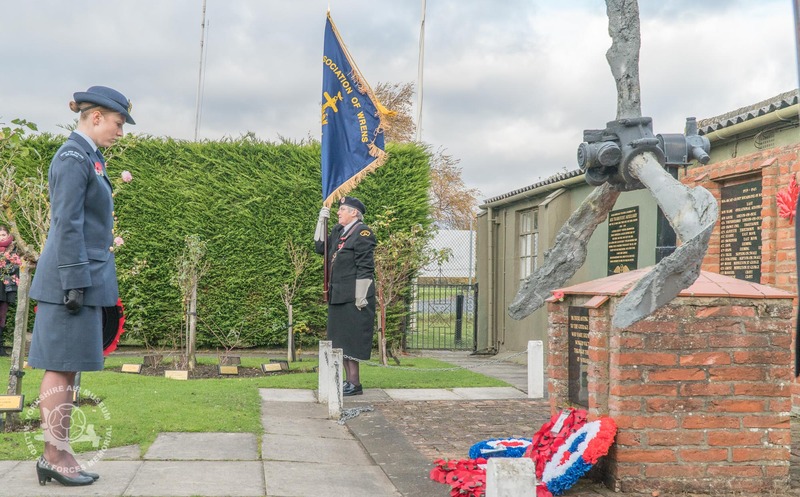 Created in 1957 as a memorial to those who flew from RAF Elvington to free their homeland, even today a group travels from France each year to be with us and remember their countrymen. Joining us were representatives from air forces across the world including Australia, New Zealand, France, Canada the Royal Air Force and The United States Air Force. Making the journey from his home in France was André Hautot. A young sixteen year old when he signed up to serve in the French Squadrons here, he flew as a rear gunner in Halifax bombers. It was, as ever, heart warming to see the reception given to everyone from the residents of Elvington village. Even today, the story of the sacrifice made by those flying in conflicts across the world is passed on to these younger residents of the village in the hope that this knowledge will help prevent similar global conflicts in future. After lunch in the NAAFI restaurant, a short service in our Chapel included the awarding of the Legion d’Honneur to three more Normandy veterans who fought in WW2 to help liberate Europe after D Day. A final ceremony in the Memorial Garden gave us all a moment to reflect on the current state of the world, on those who lost their lives in global conflicts and of people we know personally who are no longer with us. Remembrance will continue around the world long after those who served have passed from living memory. It is truly inspiring to see today’s younger generation appreciating those that have gone before them and gives hope that they are truly learning lessons for the future. Below you will find a selection of images from Remembrance Sunday that shows the diverse range of people and nationalities that continue to take time for Remembrance each year.